Red Sox manager Don Zimmer was ejected from this game on April 14, 1980. Groundskeeper Jim McCarthy did some maintenance on the bullpen mound in 1983. The Citgo sign was turned back on in 1983 after being dark for several years. Carl Yastrzemski strolled around Fenway Park to salute fans who turned out to honor him in one of his final games before retirement on Oct. 1, 1983. Ted Williams joined team owner Jean Yawkey as his and Joe Cronin's numbers were retired by the Red Sox on May 29, 1984. ''Oil Can" Boyd and Jim Rice were tucked into the corner of the Red Sox dugout in this Aug. 23, 1985, game. Bill Buckner dived in vain for this foul ball in 1985. Roger Clemens showed off the ball he used in his 20-strikeout game a day earlier on April 30, 1986. Daniel Hatfield, Nathan Burbar, and Josh Barrett, all of New Brunswick, loaded up on souvenirs during a trip to Fenway in 1986. Ted Williams posed with Carroll Hardy, right, the only player ever to pinch-hit for him, during the 1986 Old Timers game at Fenway. ''Oil Can" Boyd jumped into the arms of catcher Rich Gedman after the Red Sox clinched the AL East title on Sept. 28, 1986. Fans settled in for a cold wait outside Fenway Park for playoff tickets on Oct. 5, 1986. Jim Rice saluted the fans after his three-run home run against the Angels in Game 7 of the 1986 ALCS. Red Sox players celebrated their first AL pennant in 11 years after winning Game 7 of the ALCS. Fans joyously celebrated the Red Sox winning a berth back in the World Series. Workers used a crane to hoist the center field scoreboard out of Fenway Park so it could be replaced. Fans in the bleachers regularly tracked strikeouts during Roger Clemens's starts with K cards hung on the wall. In 1989, Fenway Park underwent a radical reconfiguration when the glass-enclosed 600 Club debuted. Teammates congratulated Wade Boggs after his home run helped power a win over the Rangers on May 7, 1989. 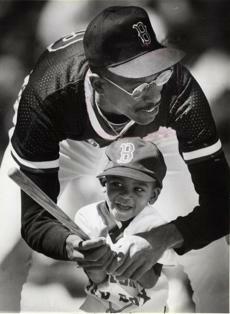 "Oil Can" Boyd took a swing with his son, Dennis Boyd Jr., during family day on Aug. 26, 1989. Newly signed Red Sox closer Jeff Reardon and his wife met with Red Sox owner Jean Yawkey in December 1989.